It’s disgusting, it’s harmful to your health, it’s damaging to your building…its mold. Even in biblical times mold was a cause for concern as mentioned in the Book of Leviticus, 14: 33-45. However, it wasn’t until relatively recent that the scientific community identified mold and other fungi as possible causes of human’s adverse health effects. Since the late 90’s the word “mold” has struck fear in the hearts of building owners, homeowners, and insurers. The stigma around having mold in a business can have far-reaching effects. Exposure to damp and moldy environments may cause a variety of health effects or none at all. Some people are sensitive to molds. For these people, molds can cause nasal stuffiness, throat irritation, coughing or wheezing, eye irritation, or, in some cases, skin irritation. People with mold allergies may have more severe reactions. Immune-compromised people and people with chronic lung illnesses, such as obstructive lung disease, may get serious infections in their lungs when they are exposed to mold. These people should stay away from areas that are likely to have molds, such as compost piles, cut grass, and wooded areas. In 2004 the Institute of Medicine (IOM) found there was sufficient evidence to link indoor exposure to mold with upper respiratory tract symptoms, cough, and wheezing in otherwise healthy people; with asthma symptoms in people with asthma; and with hypersensitivity pneumonitis in individuals susceptible to that immune-mediated condition. The IOM also found limited or suggestive evidence linking indoor mold exposure and respiratory illness in otherwise healthy children. While there are preventative measures a building owner can take, no system is perfect and mold can go undetected. An entire book can be written about how mold grows and the different types of mold, but in general, mold needs three things to thrive: moisture, warmth, and food. Many building materials are a great food source for mold growth, so all that is left is moisture and warmth. The biggest key to prevention is controlling the moisture within a facility. If that system fails, a licensed contractor can help. 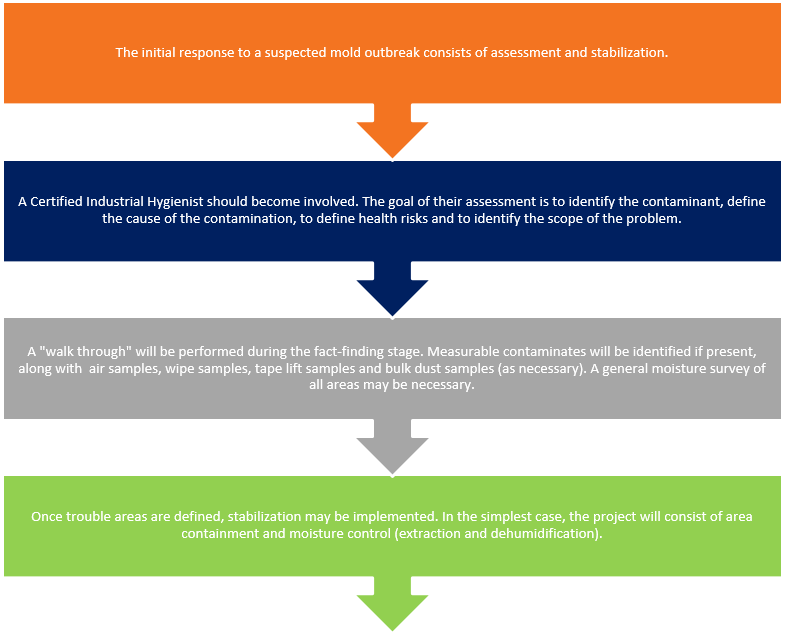 Attempting to remediate mold internally may have devastating effects if performed improperly. Additionally, state laws regarding mold may differ, so research the requirements in your state. It may be beneficial to contact a Certified Industrial Hygienist to test for mold and develop the protocol. This gives the restoration contractor a guide for how to treat the infestation. It is important to note that a restoration contractor should not do the initial testing on potential mold or microbial growth. They may perform periodic testing to track the progress of the restoration but a third party should test before and after the restoration for clearance. So you have found mold, it is important to communicate to building occupants consistently and directly. A single spokesperson should disseminate information to occupants, and if required, to the general public. All other participants should avoid sending mixed signals, as a single, scripted response should be used to calm fears. Health and safety are a major consideration during a mold remediation project. While every loss is unique, consideration for both workers and occupants (if present) must be taken when developing a health and safety plan. Because personal protective equipment must be worn, employees must be trained in the proper use of PPE and monitored for overheating. 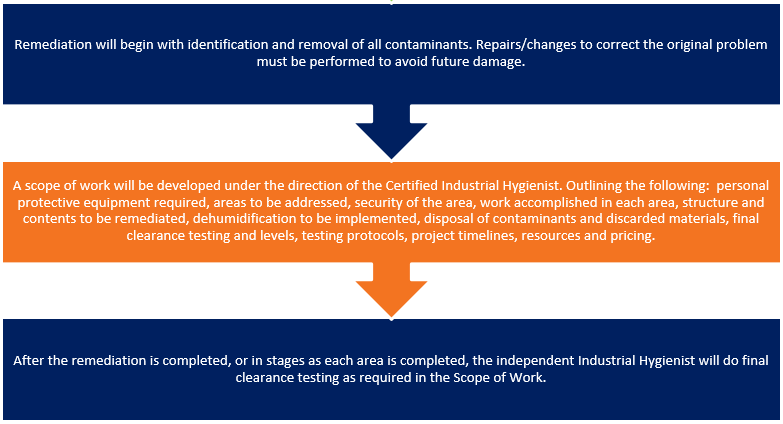 Protective clothing must be removed and replaced each time a worker leaves and re-enters the containment during remediation with containment leading to a “clean” area. In general, individuals who may come in contact with water damaged materials should have current tetanus shots and protect hands, eyes, and mouth using personal protective equipment. Biocide chemicals used to kill microorganisms can be potentially harmful to humans and can cause respiratory injury. Instructions for application and dilutions of antimicrobial agents should be carefully followed. If there is any advance notice of potential water damage, all possible protective measures should be taken such as covering items with plastic, raising furniture and protecting electronics. Additionally, consider permanent storage of certain valuable items (rare books, historical newspapers or long term archival documents) in buffered, acid-free storage boxes.